Being a reputed name in hotel industry , we “Adhavan Residency has established ourselves in providing 24 hours room service facility in order to make client’s stay better. Our experienced and professional staff is always ready to serve in efficient way. We always strive hard to meet clients requirements. We have become a preferred choice of customers as we make their stay as their own room. 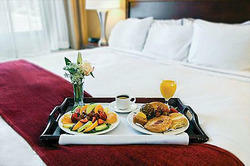 We offer 24 hours room service. Engaged in the providing services such as 24 hour room services. For those who want to enjoy cozy solace at the comfort of their rooms – we understand you, that’s why we offer 24/7 room service that truly caters to you needs round the clock. Adyar Guest house providing distinctive accommodation, fine dining and exclusive business facilities to the discerning travelers and customers, we are setting the standards for hospitality, comfort and ambience.